The follow-up to 2010's masterpiece ‘The Epigenesis’ marks the band's sixth full-length album and features iconic guests Max Cavalera (SOULFLY, CAVALERA CONSPIRACY, KILLER BE KILLED), Sakis Tolis (ROTTING CHRIST) and Rob Caggiano (VOLBEAT, ex-ANTHRAX). Ashmedi commented: "I am flattered and honoured to have esteemed guests appear on this multifaceted album. ‘Enki’ solicited different approaches and new experiences. Max is a lion - I love his voice and the tribal and historic parallels of our lives are uncanny, he did an amazing job on 'Lost Tribes'. Sakis is an old friend and we toured together in the past. His voice added another dimension of mysticism on our 'Enki - Divine Nature Awoken'. Rob and I always wanted to collaborate and he is an agile and excellent guitar player so the lead he did on 'The Palm, the Eye and Lapis Lazuli' was perfect , it rocks and serves the track well. They all did an outstanding job and went above and beyond to make it happen despite their busy schedules. 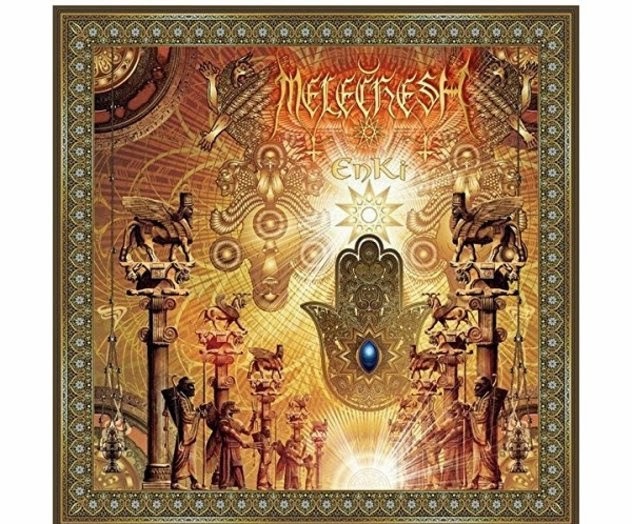 MELECHESH is more than a band - it is a society!" ROTTING CHRIST's Sakis Tolis gushed further: "When I was told that our brother band MELECHESH would record their upcoming album in my hometown, I immediately picked up the phone and called Ashmedi to participate somehow. Ashmedi responded positively so I was ready to raise some serious hell... It is very interesting since we are sharing the same Mediterranean mentality as individuals. I believe this new album is one of the most unique and atmospheric metal albums I have heard the last years. Ashmedi took me to their majestic oriental path and showed me the way to the new Babylon. I am definitely proud working with the Kings of Fire and I really recommend to check the new MELECHESH album - it is really good!" Enki features 12 string electric guitars aside from the 6 string played on the entire album, for a heavier and subtly richer harmonic sound. The band also tuned their instruments to the pitch perfect 432 Hz frequency, rather than the standardized 440 Hz one, for a deeper sonic experience within the human psyche and in accordance to the vibrations of the universe. The majority of the album was recorded in Greece and was mixed & mastered at Black Lounge Studio in Sweden by Jonas Kjellgren.